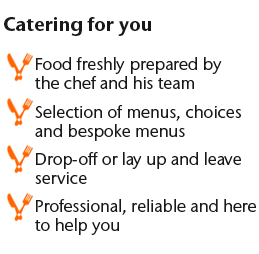 At Clockhouse Catering we know this is a difficult time and we are here to help you. It will be my pleasure to personally guide you through your needs for the day. With over 15 years experience in catering for funerals, memorials and wakes in homes, halls and larger venues, we know what is required and our professional service is given with sympathy and understanding. We expertly prepare our food, using the freshest and tastiest ingredients available and we can cater for 20 to 300 people across a range of menu choices, including bespoke menus. Our service can include waitressing staff and equipment hire (anything from glasses and crockery to marquee hire) or we can provide a drop-off or lay-up and leave service. These menus can be adapted to suit your needs and we can cater for any guests with specific dietary requirements. It will be my pleasure to cater for you.